In the third installment of the Lady Trent Memoirs, we follow Isabella on her sea voyage around the island nations of her world. Naturally nothing goes as planned and Isabella finds herself getting into trouble with the locals and two of the most powerful governments. All she wanted to do was study dragons! I have to say, the Memoirs by Lady Trent get better with each new book written. 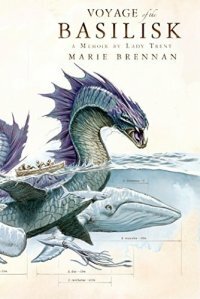 I thought the first one, A Natural History of Dragons was only okay, but now, with this third book, I'm hooked on the series. Isabella is definitely aging like fine wine and I greatly appreciate the insights maturity and age have been bringing her. Brennan certainly has a talent for writing interesting characters. The book may center around Isabella, but there is a full cast in this book that add even more flavor to the book. From a potentially mentally unstable ship captain to a transgender woman with a dragon's spirit, the characters give this book so much life. So if you're looking for a book to take you to another world and think about the science of dragon anatomy, taxonomy and preservation while also putting you into the middle of a war, I highly recommend this book. Brennan is getting better with each one.